Because as a company we are involved in “integration” of services, we use and service many different technologies. Our business is about making things work together. Below, you can find a summary of our main activities. A core OWS activity is in the field of building automation. 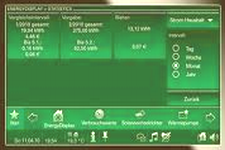 Remote control of programmed devices around the office, factory or private dwelling fulfils the needs of comfort and convenience, but can also contribute towards greater energy efficiency and compliance to regulations. The need for electrical appliances to dim or shut off automatically in response to environmental conditions is likely to be a key focus of future construction practices. With the emphasis on the KNX "Konnex" bus (an automation standard based on EIB, BatiBUS and EHS), OWS installations enable property owners to control shutters, dimmers, light switches, heating and other devices by remote control, to a schedule, or in response to ambient conditions. Please click <here> for details of an example Assisted Living Project This "smart technology" can be used to subtly adjust heating, window apertures and solar panel orientation, with a view to keeping energy wastage and expenditure to a minimum. The great advantage of KNX over other automation technologies is its open standard basis, supported by multinational companies with stature, such as ABB and Siemens. Proprietary alternatives are supported by only one company, whereas KNX allows for different manufacturer products to communicate efficiently and clearly on the same network. All products have to comply with rigorous testing stipulations, making for a reliable and future-proofed network. 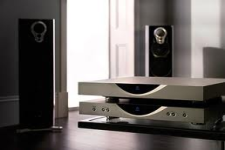 OWS designs and installs high-fidelity wiring and sound systems, across a wide range of reputed brands, from Linn Audio, to Nuvo, and Systemline. The installations range from multi-room audio, to home cinema, surround-sound setup, and HD distribution around the property. The St. Albans showroom (click <here> for more details) includes an example home cinema installation equipped with some of the latest technologies; an in situ experience is available to clients visiting for a consultation. 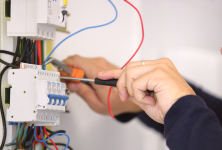 OWS provides infrastructural electrical wiring services to the building trade, renovation projects and retail chain refitting, amongst others. The company has worked on projects throughout the United Kingdom, from Aberdeen to Southampton, as well as overseas, from Gibraltar to the Middle East, with on-call electricians ready to undertake residential work in London and the Home Counties. OWS offers maintenance services to offices, residential complexes and public buildings, schools and colleges. All work is carried out to NICEIC standards. OWS performs regular appliance and building testing on request, including PAT testing. Visit to see examples of Kundalini, Artemide, The Lamp Company, Masca, Elstead, Endon, Franklite, Vibia, Flos, Harco Loor and AVMazzega, and many more. Staff can advise on custom-made lighting, security illumination, architectural lighting, environment- friendly solutions, and fittings suitable for all locations. The shop stocks and supplies a wide range of energy-efficient fittings and lamps. Visitors are welcome to come and see the products on display, or browse through a wide range of catalogues. 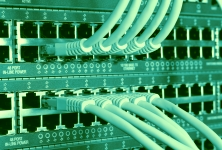 OWS provides structured data cabling services, from patch panels to routers and switch configuration, according to TIA-568 CAT5 and CAT6 standards. The company has also undertaken KNX, Modbus, Kerpen, RS-485, and other network installations. As fibre becomes the standard for backbone and infrastructure cabling, we anticipate increasing commitment towards optical network installation. As well as setting up computer networks, OWS can provide maintenance services, such as virus removal and hardware repair, and undertake programming tasks. OWS engineers can integrate IT infrastructures with PABX telephone systems and audio-visual control software. General information about fibre technology is available on our Fibre-(Fiber)-Optic Cabling Overview page. Details of an example project are to be found on the Media Archiving Centre Fibe-Optic Installation Project page. 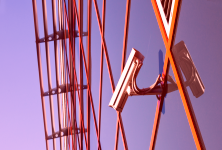 OWS supplies and installs CCTV and alarm systems. This may include access control, zone sensors, remote maintenance and card/token recognition. OWS can devise appropriate systems for businesses and residential premises alike, whether it be to arrange a remote monitoring system for a house, viewable from a smartphone, or a network of fob-operated gateway controls suitable for a residential complex or office campus. Fire alarms and smoke detectors can also be installed. 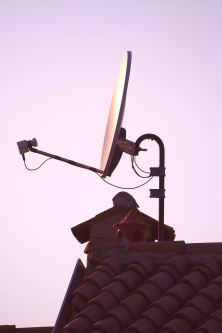 To complete the provision of media services, OWS also installs aerials and satellite dishes, catering for single or multipoint TV systems, to provide Sky, Freesat, Freeview and HD to the end user. The visual impact of satellite installations is minimised by the use of discreet cabling and hidden dishes wherever possible. OWS is ready to supply all that is required for the digital switchover, whether it be for DAB radio reception, smart TV or Internet TV for streaming digital services to homes and businesses. Respositioning and realignment of dishes is also offered for customers having problems with an existing installation. “Integration” is a key word in a field where different services and facilities need to be brought together to work in harmony. It is the “glue” that provides that nebulous communication required to simply make things work. Being active in more than one field of expertise, OWS has that, often neglected, ability to plan, implement, monitor and rectify integrated services. Please call on +44 (0)1727 739 739 if you would like more information. 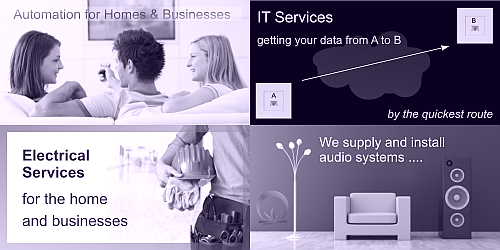 IMAGE TEXT: (Composite of 4 images) Automation for Homes and Businesses; IT Services, getting your data from A to B; Electrical Services for homes and businesses; We supply and install audio systems.